Today is Halloween and time for cover art showing haunted houses and graveyards. I count thirteen of them, mostly from the postwar era and more than half of them from two artists, Lee Brown Coye and Matt Fox. Again, there seems to be some significance to the fact that after World War II, popular culture returned or at least tried to return to prewar monsters, horror, and fantasy. Did it work? Maybe for a while. The again, maybe not. The war changed the world beyond any going back, despite the drive among writers of fantasy and weird fiction to return to the past or to bring the past into the present. The haunted house, a kind of ruin in which people from the past reside, and the graveyard, where the past, though never at rest, lies buried, seem to be the proper setting for weird fiction. As these covers show, they also offer the artist plenty of material for his or her picture-making. Notice, for example, that in nine of the thirteen images below there is either a bird (a vulture or a crow) or a bat. Weird Tales, April 1939. 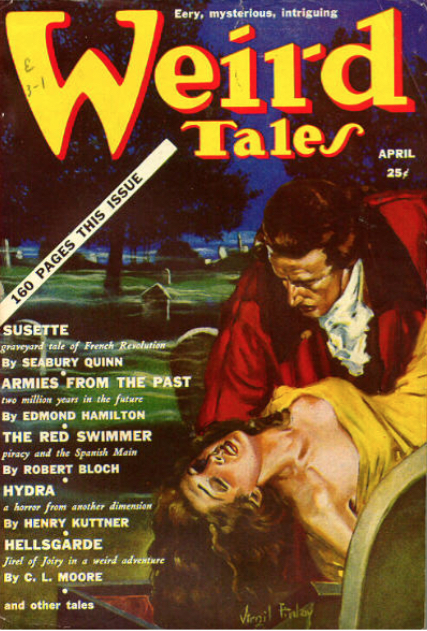 Cover story: "Susette" by Seabury Quinn. Cover art by Virgil Finlay. Weird Tales, September 1944. Cover story: None. Cover art by A.R. Tilburne. This is a fine cover. Unfortunately it's a swipe, as the image below shows. The American Weekly, Sunday, October 18, 1931. 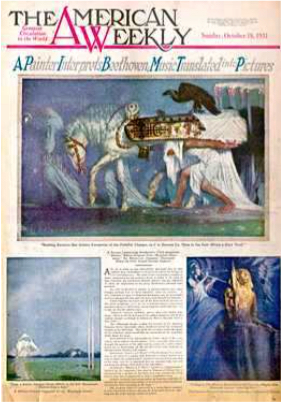 The article is called "A Painter Interprets Beethoven; Music Translated into Pictures," and though the image of this page is too small to read, it seems certain to me that it is about the Spanish artist Josep Segrelles Albert (1885-1969), also called Josep Segrelles or Jose Segrelles. Segrelles' art predates Tilburne's by thirteen years. You could argue that Tilburne, up against a deadline, might be justified in swiping an image from an old newspaper article. In other words, no one would have known. You could also argue that Tilburne made the image his own in some ways, by redoing the background and in general by tightening up and more or less posterizing the remainder of the image. His vulture actually looks better than that drawn by his predecessor. (Tilburne was especially good with animals.) Still, it's a swipe and seemingly done without attribution. Speaking of attribution, the website Yankee Classics identified this swipe before me. Weird Tales, July 1945. Cover story: None. Cover art by Lee Brown Coye. This was Coye's first cover for Weird Tales. It's not quite accurate to say that there was no cover story. 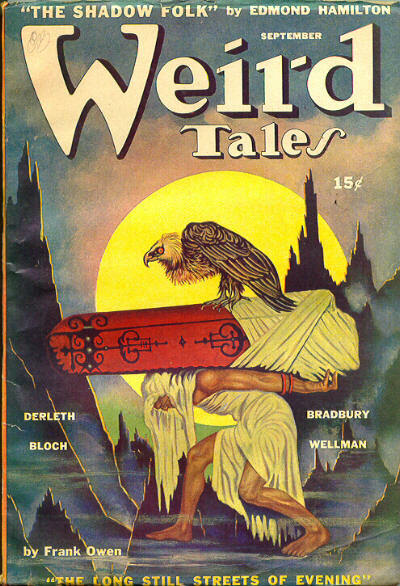 It's just that the cover story didn't appear in Weird Tales. Now that you're confused, I'll explain: Lee Brown Coye provided illustrations for the hardbound anthology Sleep No More (1944), edited by August Derleth. One of the stories in that book is "Count Magnus" by M.R. James. Coye drew a black-and-white illustration for that story, which was published in Sleep No More, then executed this color version of the same drawing. 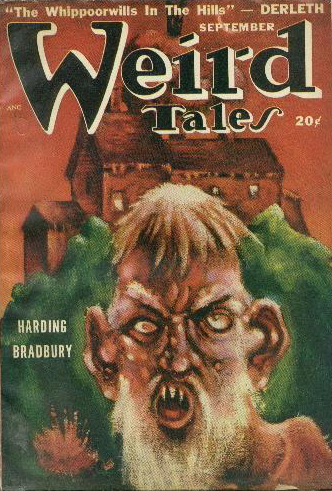 The editors of Weird Tales placed it on their cover. Unfortunately, M.R. James (1862-1936), a very fine writer of ghost stories and weird fiction, was never in the magazine. But an illustration for one of his stories was. Revision (Nov. 3, 2016): Now that I look at this picture more, I'm not convinced that it shows a scene in a graveyard. In fact I'm starting to think I should have a separate category for Lee Brown Coye's otherwise uncategorizable covers. Weird Tales, March 1946. Cover story: "Twice Cursed" by Manly Wade Wellman. Cover art by Lee Brown Coye. I'm not convinced this is an illustration for a story. It might just have been an exercise in surrealism by Coye. I can't say, as I have not read the story. The image is strange and unsettling, though. I'm not sure that it shows a haunted house, although there is a silhouette of what looks like a building on the right. I'm not sure that it shows a graveyard, either, although it shows a cross in the ground on the left. Where else would I put this cover, though? With skeletons and skulls? Revision (Nov. 3, 2016): One of my readers suggests that the shape in the background is a butte. That could very well be. Or it could be a castle. So if that isn't a gravestone on the left, then this cover has to go somewhere else, into "Skulls and Skeletons" or Coye's uncategorizable covers. Weird Tales, May 1946. Cover story: "The Valley of the Gods" by Edmond Hamilton. Cover art by Ronald Clyne. A very well done illustration, I think, and I think I detect the influence of Rockwell Kent. Weird Tales, March 1947. Cover story: "Mr. George" by August Derleth. Cover art by Boris Dolgov. Weird Tales, March 1948. Cover story: None. Cover art by Lee Brown Coye for the twenty-fifth anniversary issue and with a who's who of weird fiction writers on the cover. I think that's supposed to be a crow on the left. It looks more like a coot or a gallinule. Weird Tales, May 1948. Cover story: "City of Lost People" by Allison V. Harding. Cover art by Matt Fox. I really wish we could have Matt Fox back. Weird Tales, September 1948. 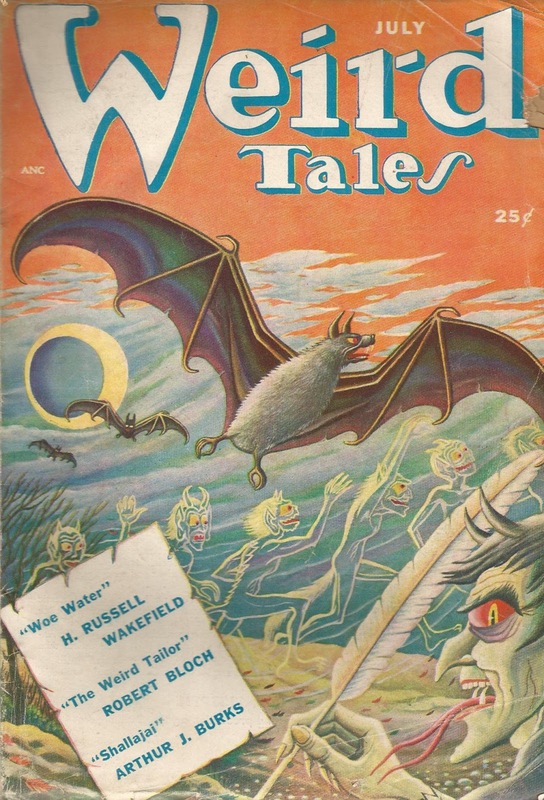 Cover story: "The Whippoorwills in the Hills" by August Derleth. Cover art by Lee Brown Coye. The story is about birds, but there are no birds on the cover. 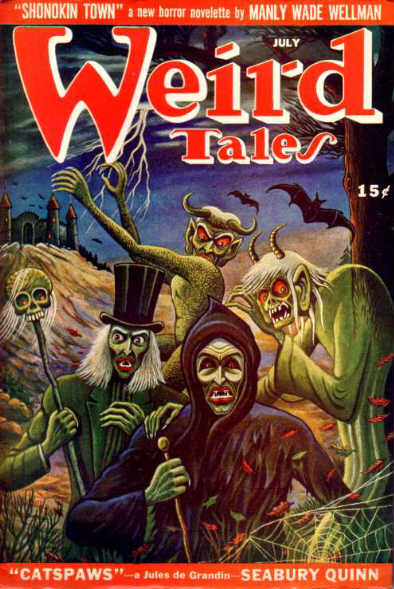 Weird Tales, November 1949. Cover story: "The Underbody" by Allison V. Harding. Cover art by Matt Fox. Weird Tales, May 1951. 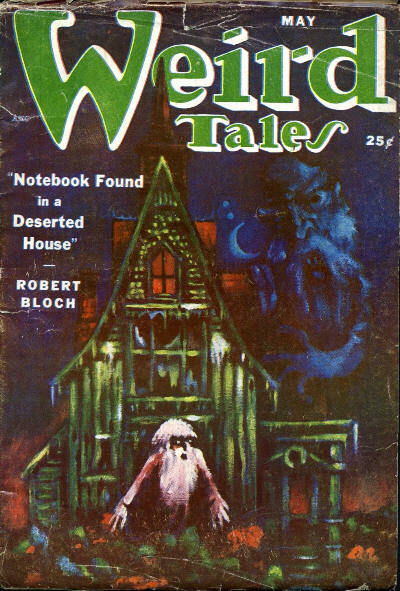 Cover story: "Notebook Found in a Deserted House" by Robert Bloch. Cover art by Lee Brown Coye. Weird Tales, January 1952. 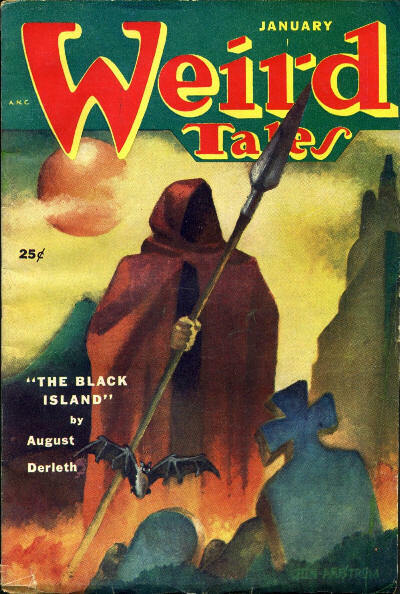 Cover story: "The Black Island" by August Derleth. Cover art by Jon Arfstrom. I heard it from Jon Arfstrom himself: this was a portfolio piece submitted to Weird Tales. It was not in the proper proportions for a cover illustration but was made so with a green patch pasted under the main title. So I'm not sure this is an illustration for a particular story, but, again, I haven't read the story and can't say for sure. Weird Tales, March 1952. Cover story: "Morne Perdu" by Alice Farnham. Cover art by Joseph R. Eberle. 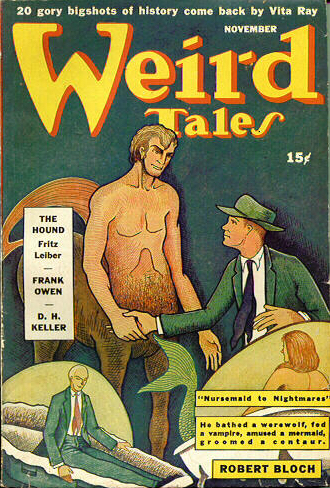 While I'm on mythological subjects, I will show the two centaur covers of Weird Tales. In contrast to Medusa, these seem like pretty nice creatures. Weird Tales, July 1934. 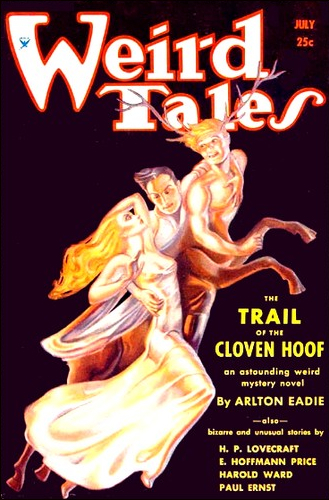 Cover story: "Trail of the Cloven Hoof" by Arlton Eadie. Cover art by Margaret Brundage. Weird Tales, November 1942. Cover story: "Nursemaid to Nightmares" by Robert Bloch. Cover art by Richard Bennett, his only cover for the magazine. Before there was weird fiction, there were myths. You might call them the weird fiction of the ancient world, and in that, you might say that all of literature began with what we now call fantasy or genre fiction. So before the Christian era, its monstrous undead, and its various forces of evil, there were mythological monsters, including Medusa, a creature so frightening and horrifying that to look upon her face was to be turned to stone. Weird Tales treated Medusa on three covers from three different places and two different eras. Fifty years separated the first from the last. Weird Tales, May 1923. Cover story: "The Moon Terror" by A.G. Birch. Cover art by William F. Heitman. 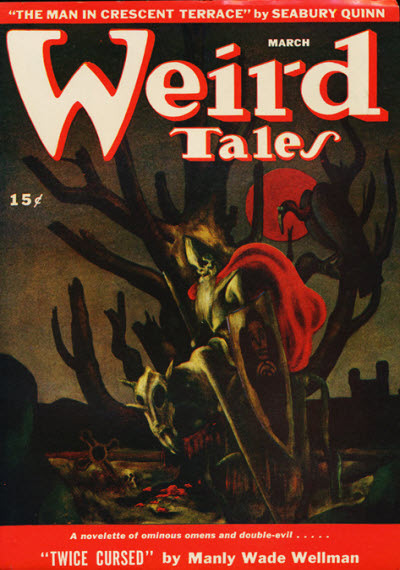 This was the third issue of Weird Tales and had the first of Heitman's two cover drawings. This is by far the better of the two. Weird Tales Canada, March 1943. Cover story and cover artist unknown. Pretty and deadly. Weird Tales, Summer 1973. Cover story: None. Cover art by Virgil Finlay. Somewhere I read--I can't find the source now--that this image was not created for Weird Tales. It arrived on the cover of the magazine by way of a visit by Sam Moskowitz to the artist's home. Moskowitz took a picture of it (note the reflection on the painted surface) and reformatted it (note the purple band across the top) for the first of his four fiftieth-anniversary issues of 1973-1974. This is the last week before Halloween and it's time for some subjects suited to the season. I'll start with devils and demons, the spirits that we are supposed to ward off with our wearing of costumes. 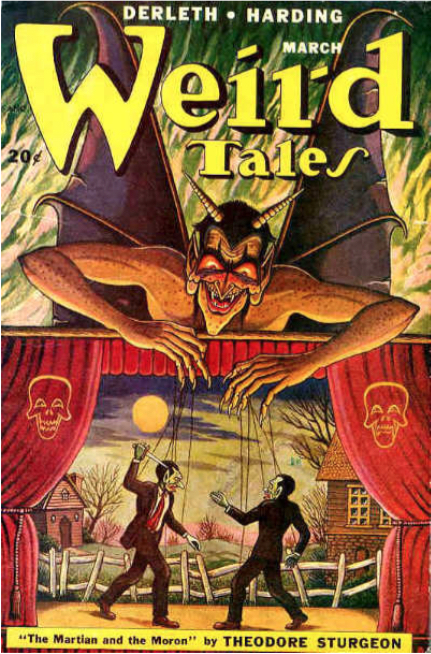 I count nearly two dozen Weird Tales covers showing devils and demons, including a few from Canada (covers, not devils and demons). I have a feeling I have missed some. If I have, they will turn up eventually and I will place them here. Three--possibly four or five--of these covers show a man dressed as a devil. The others appear to be depictions of supernatural beings. The first, showing a demon lunging at two men, is genuinely frightening. Two more show Oriental-style demons. Five show a pretty conventional figure in a devil costume. 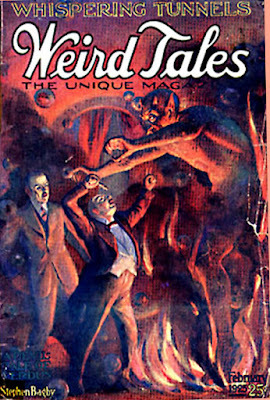 One of the least conventional and one of my favorites is Virgil Finlay's devil on the cover of the April 1937 issue. That's not to take away anything from Matt Fox, a one-man demon factory, who was responsible for six of the twenty-two covers here. And I see by the cover of May 1945 that I have an addition to make to my list of Weird Tales covers featuring circles and spirals. 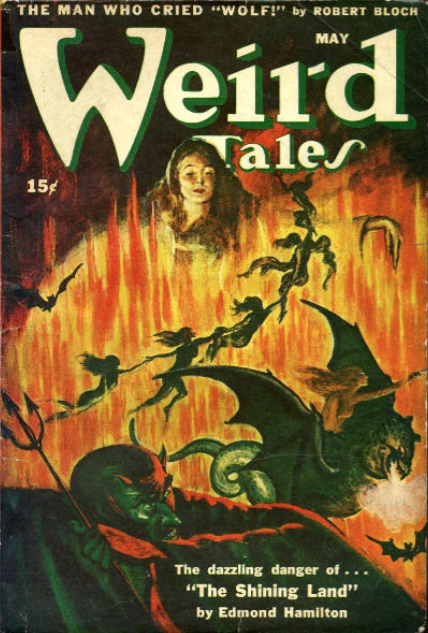 In any case, here are the devils and demons on the cover of Weird Tales. 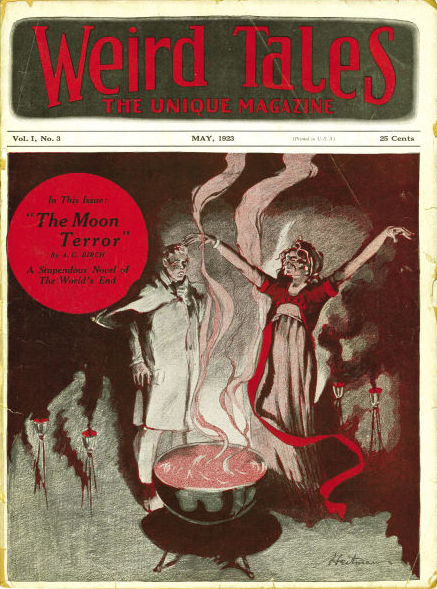 Weird Tales, February 1925. Cover story: "Whispering Tunnels" by Stephen Bagby. Cover art by Andrew Brosnatch. This is a somewhat poor image. It looks like whoever scanned it did not descreen the image. Below is a larger but less clear version. Weird Tales, April 1929. 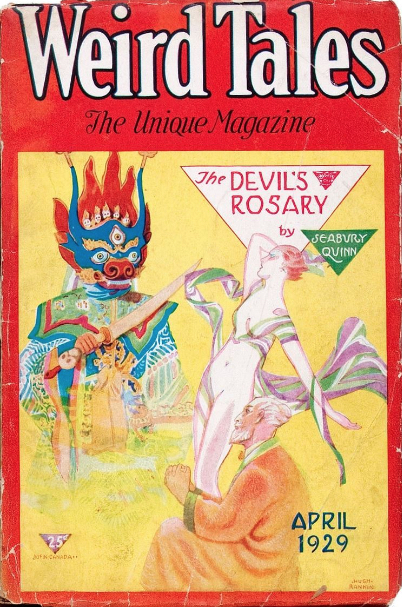 Cover story: "The Devil's Rosary" by Seabury Quinn. 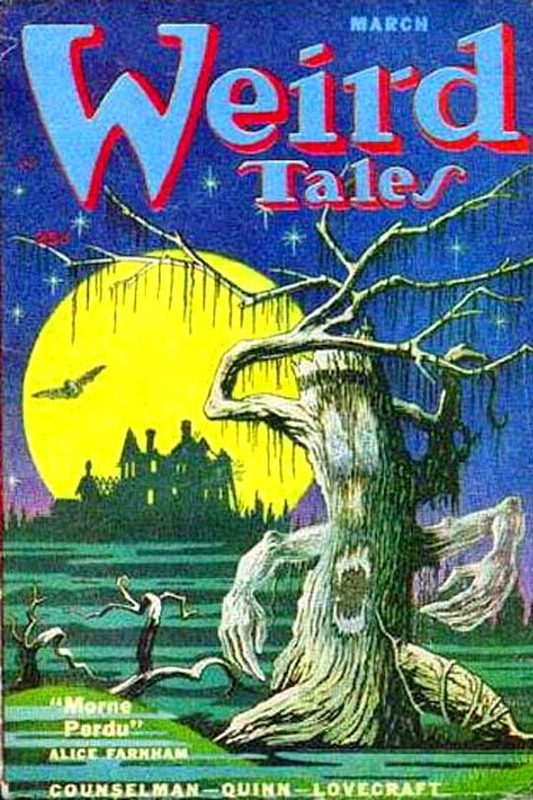 Cover art by Hugh Rankin. Hugh Rankin was no spring chicken when he created this cover. Born in 1878, he was already half a century old when it was published. C.C. Senf, another Weird Tales cover artist of the 1920s, was only five years his senior, but what a difference those five years (and Senf's European birth and education) made. While Senf was an old-fashioned artist suited in many ways to the backward-looking tendency in weird fiction, Rankin was up-to-date, capturing in his art the look of the 1920s. There is without a doubt an art nouveau influence: the flowing grace of that art movement shows through here. But there is also a distinct art deco look to Rankin's work. Witness the geometric forms and, more to the point, the art deco/1920s female figure, small in the bust, somewhat long in the waist, with rouged cheeks and bobbed hair. There ought to be a collection of Hugh Rankin's work in book form, for he was an artist too-neglected in his time and ours. 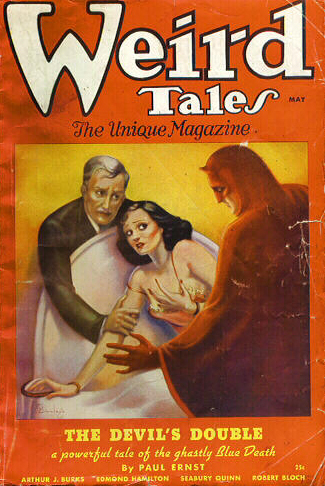 Weird Tales, February 1931. Cover story: "Siva the Destroyer" by J.-J. des Ormeaux. Cover art by C. Barker Petrie, Jr., the second of two Oriental-style demons on the cover of the magazine. Weird Tales, June 1935. 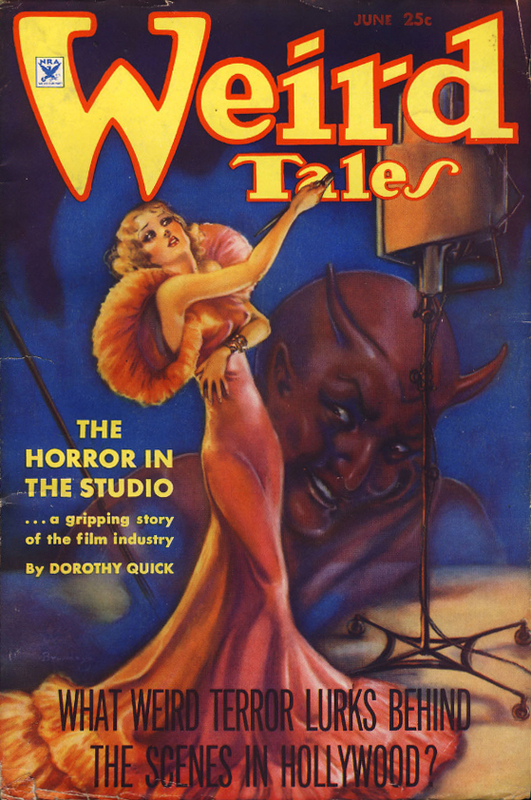 Cover story: "The Horror in the Studio" by Dorothy Quick. Cover art by Margaret Brundage. Not an especially scary devil. Weird Tales, August 1935. Cover story: "Doctor Satan" by Paul Ernst. Cover art by Margaret Brundage. This was the first appearance of Paul Ernst's series character Doctor Satan, who is, as I understand it, not a supernatural being but a normal person, albeit in the weird hero category. Weird Tales, May 1936. 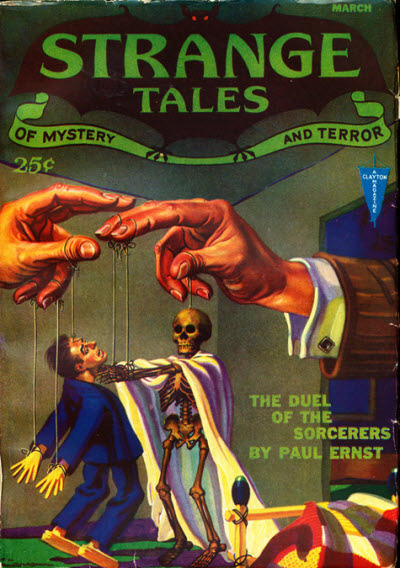 Cover story: "The Devil's Double" by Paul Ernst. Cover art by Margaret Brundage. This was the seventh Dr. Satan story. Weird Tales, April 1937. 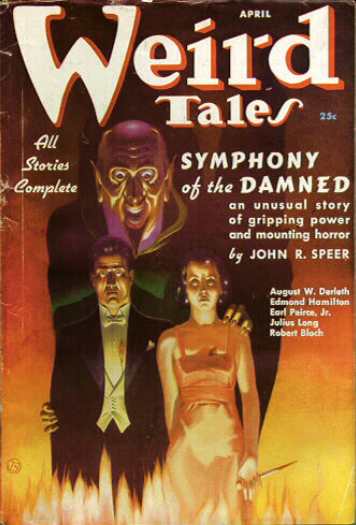 Cover story: "Symphony of the Damned" by John R. Speer. Cover art by Virgil Finlay. One of Virgil Finlay's weaknesses as an artist was his repetitiveness: he tended to draw the same monster or demon again and again. (See the cover for May 1952, below, for an example of that.) In this cover, however, he created an original and arresting image of a devil, despite the conventions of pointed beard, mustache, ears, and horns (at least I think they're horns). Weird Tales, September 1937. 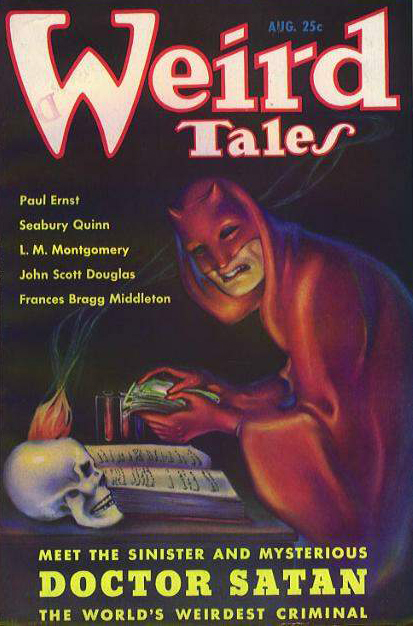 Cover story: "Satan's Palimpsest" by Seabury Quinn. Cover art by Margaret Brundage. Margaret Brundage created works of great delicacy, grace, and beauty. She was especially good at depicting women. But she may not have had what it takes to create truly frightening and horrifying demons, monsters, or creatures. Here again, she drew a conventional and not very scary devil. 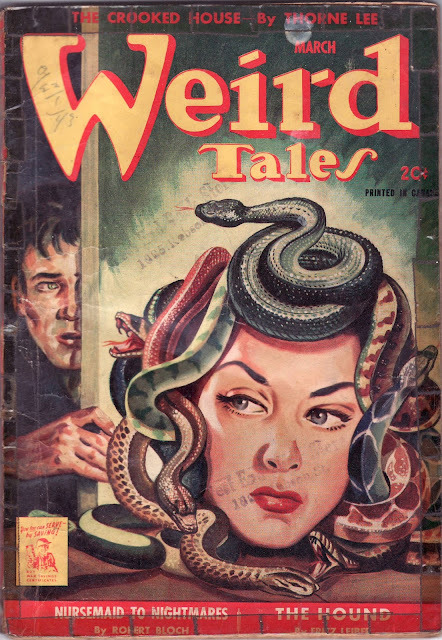 Weird Tales, Canada, July 1942. 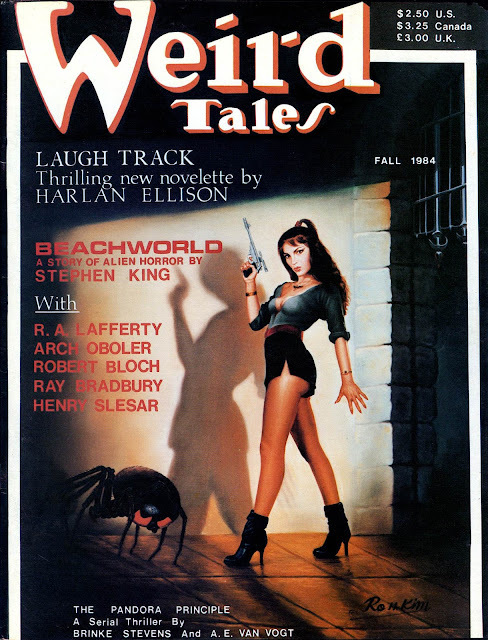 Cover story: "Hell on Earth" by Robert Bloch. Cover art by an unknown artist. 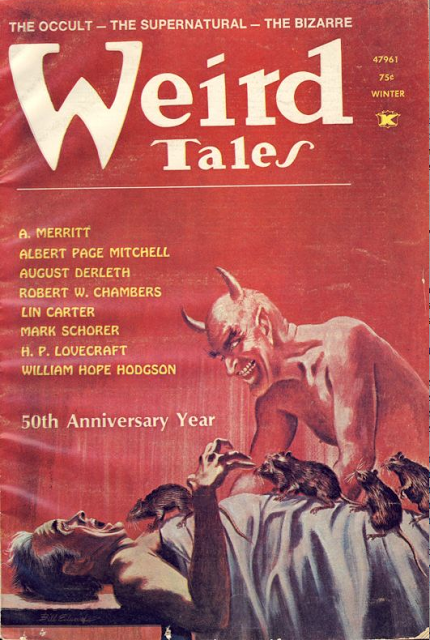 The Canadian edition of Weird Tales has been neglected by people who study the magazine. I aim to correct that as best I can in a later series. 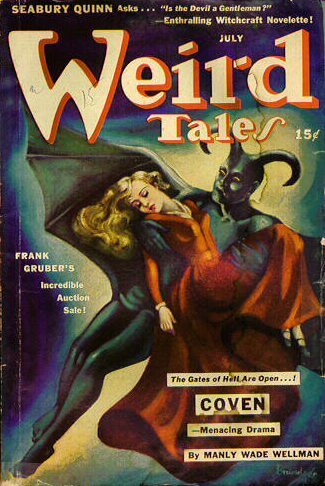 For now, we'll have to settle for what we know about the series' cover artists, which isn't much and does not include the name of the creator of this devil cover of July 1942. Weird Tales, July 1942. Cover story: "Coven" by Manly Wade Wellman. Cover art by Margaret Brundage. 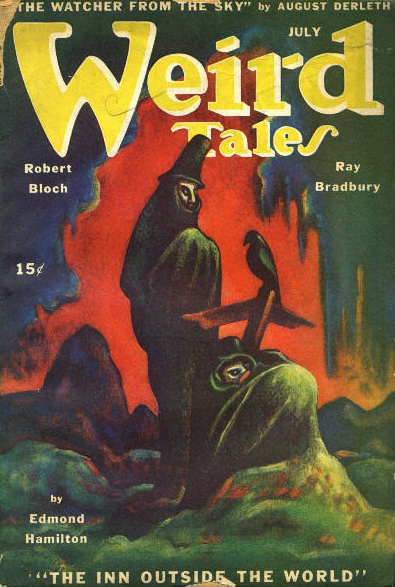 The American edition of Weird Tales for July 1942 came first but I have put it after the Canadian edition here because of the cover story it shared with the Canadian edition of November 1945, shown below. The cover artist was Margaret Brundage. Her approach with this cover was very much different than with her pre-war covers for Weird Tales: less Busby Berkeley, more Val Lewton. 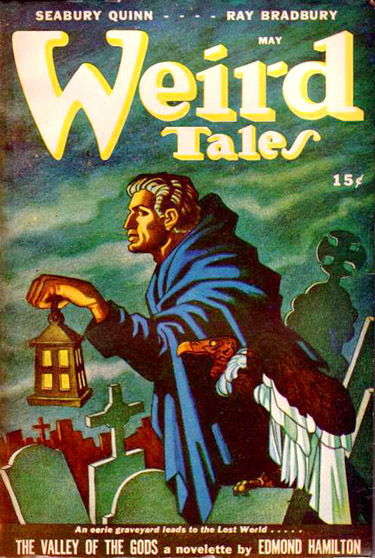 Weird Tales, Canada, November 1942. Cover story: "Coven" by Manly Wade Wellman. Cover art by an unknown artist. Weird Tales, Canada, January 1945. Cover story: "The Shadow Folk" by Edmond Hamilton. Cover art by an unknown artist. Weird Tales, May 1945. Cover story: "The Shining Land" by Edmond Hamilton. Cover art by Peter Kuhlhoff. I wrote awhile back about the return to the conventions of horror and fantasy as World War II came to an end, and in the years after. This seldom-seen cover by Peter Kuhlhoff, as well executed as it is, is another example of that. It came out in the month in which the war in Europe ended. If I had to show a bunch of people flying through Hell in May 1945, more than few Nazis would come to mind. Weird Tales, July 1946. Cover story: None. Cover art by Matt Fox. Weird Tales, May 1947. Cover story: None. Cover art by Matt Fox. 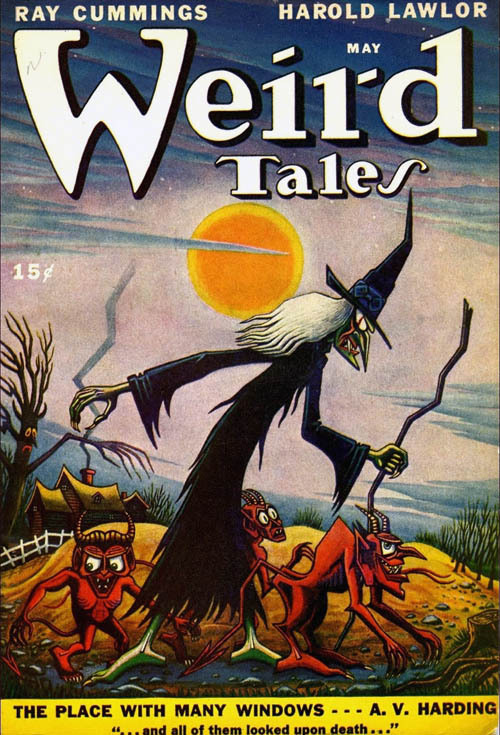 Weird Tales, November 1947. 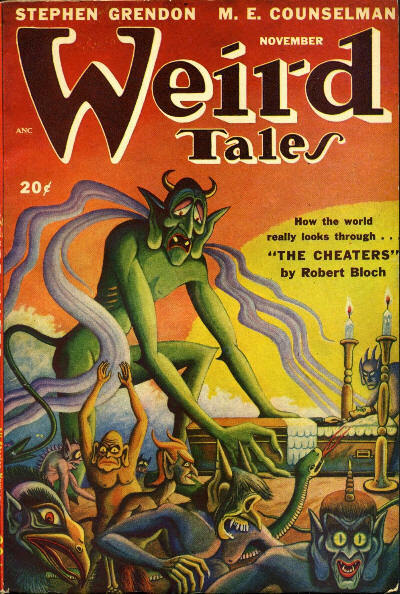 Cover story: "The Cheaters" by Robert Bloch. Cover art by Matt Fox. Weird Tales, March 1949. Cover story: None. Cover art by Matt Fox. 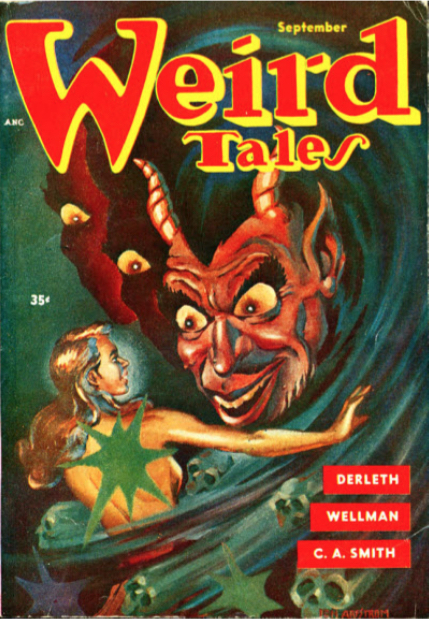 In regards to the postwar artists for Weird Tales, many depicted the conventions of horror and fantasy again and again, even as the world had changed and the magazine published a lot more science fiction under editor Dorothy McIlwraith. I don't know what to make of that exactly except that weird fiction is more interested in the past than in the present or future. 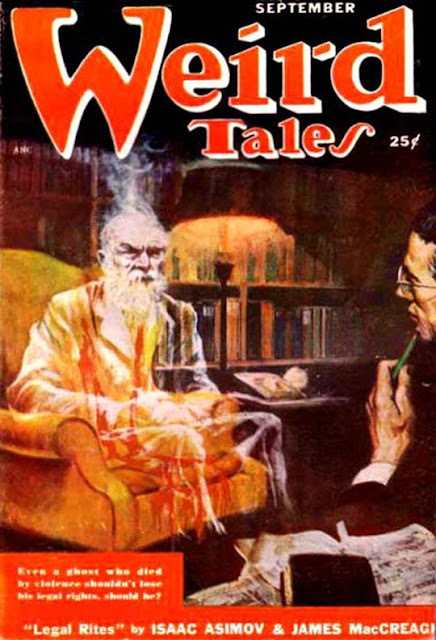 Matt Fox's cover reminds me of this cover, by Wesso, for Strange Tales, March 1932. 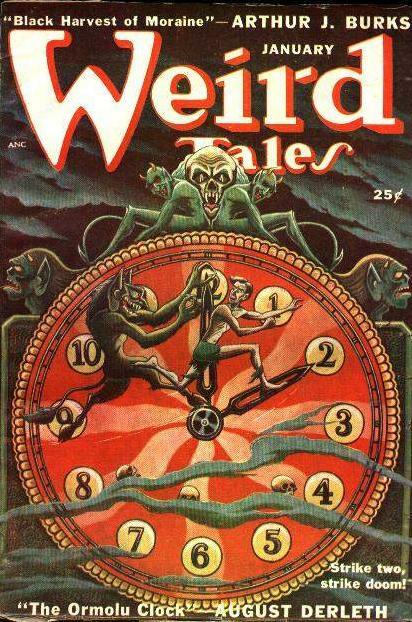 Weird Tales, January 1950. Cover story: "The Ormolu Clock" by August Derleth. Cover art by Matt Fox. Weird Tales, July 1950. Cover story: None. Cover art by Matt Fox. Weird Tales, May 1952. Cover story: "The Lamia in the Penthouse" by Thorp McClusky. Cover art by Virgil Finlay. Weird Tales, September 1953. Cover story: None. Cover art by Jon Arfstrom. I guess I could add this cover to the lists of skull covers and covers with circles and spirals. Weird Tales, Winter 1973. Cover story: None. Cover art by Bill Edwards. Robert Weinberg has died. 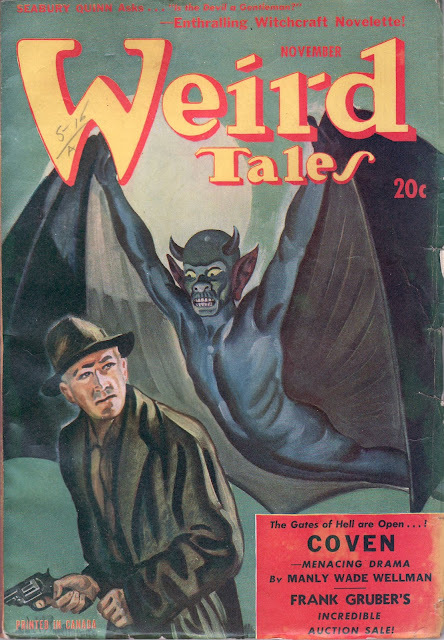 As a writer, editor, publisher, fan, and collector, Mr. Weinberg did more than anyone, I think, to carry Weird Tales from the defunct era of the pulps into the 1970s and beyond. 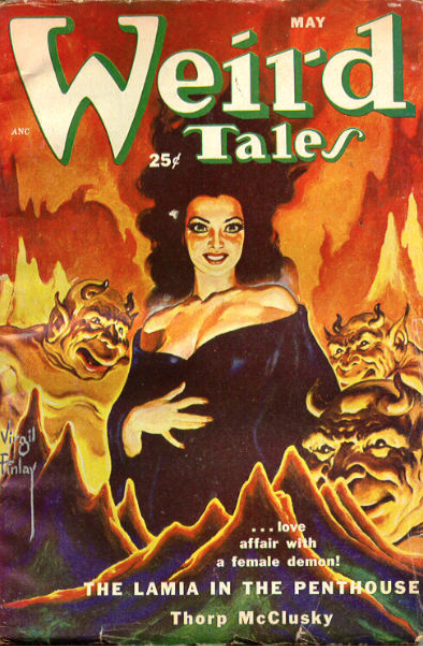 He acquired the Weird Tales property from Leo Margulies in the mid 1970s and immediately set about reviving the title and the franchise with WT 50: A Tribute to Weird Tales (1974), a self-published paperback that included material both old and new. 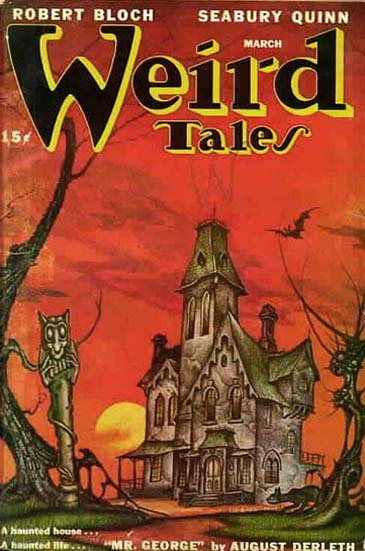 Mr. Weinberg followed up that effort with the hardbound volume The Weird Tales Story in 1977 and a six-part serial, The Weird Tales Collector, published from 1977 to 1980. If I understand my history of the property correctly, Robert Weinberg was owner when various revivals of the magazine came about, in 1980-1983 under Lin Carter; 1984-1985 under Gordon M.D. Garb; and 1988-2010 under George H. Scithers, Darrell Schweitzer, John Gregory Betancourt, Ann VanderMeer, and Stephen H. Segal. 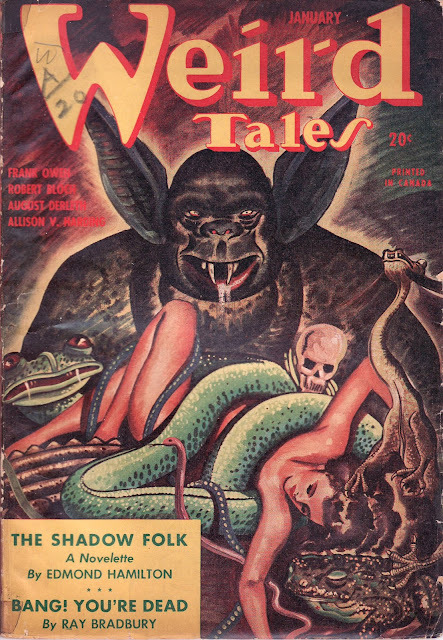 As his health declined, Mr. Weinberg sold the Weird Tales property to Viacom, while the license to publish a magazine passed to Marvin Kaye in 2012. That is how I understand the situation anyway. 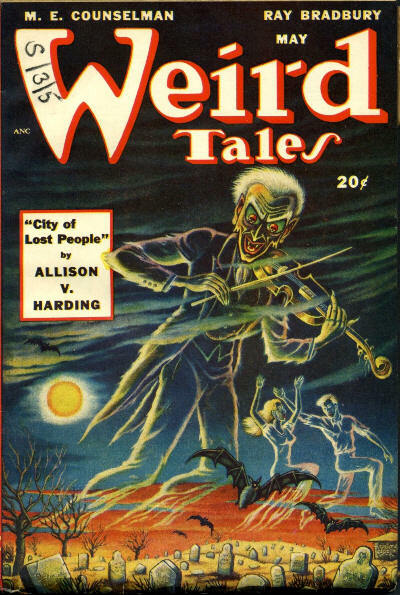 Unfortunately, Weird Tales is, at this point, moribund and in need once again of revival. It is unfortunate as well that no one of Robert Weinberg's caliber as an editor, publisher, and--perhaps most importantly--fan and devotee seems to be standing ready to do what he did with Weird Tales. No one can speak for the departed, but I feel certain that Robert Weinberg would not have wanted this to happen. As for biographical facts on Robert Weinberg: He was born on August 29, 1946, in Newark, New Jersey, in the first year of the Baby Boom and in the last decade of Weird Tales in its original run. According to the Internet Speculative Fiction Database, his first published work in a genre magazine was a letter in Robert A.W. Lowndes' Magazine of Horror in November 1965. Mr. Weinberg's first credits as magazine editor (Deeper Than You Think . . . , Jan. 1968); reviewer ("Skull-Face and Others" in Deeper Than You Think . . . , Jan. 1968); fictioneer ("Destroyer," in If, May 1969); essayist ("Some Notes on Robert E. Howard," in Return to Wonder #7, Nov./Dec. 1969); author of non-fiction (The Robert E. Howard Fantasy Biblio, 1969); and poet ("Heaven, Hell," in Return to Wonder #8, Jan./Feb./Mar. 1970) followed in rapid order. Those works began a career that lasted half a century and ended only with Robert Weinberg's death on September 25, 2016, in Oak Forest, Illinois. I would like to thank Randal A. Everts for bringing Robert Weinberg's passing to my attention. I would also like to offer to the Weinberg family my sympathies and, on their behalf, the sympathies of everyone who dreams, writes, reads, and enjoys works of fantasy, horror, and science fiction, a field to which Robert Weinberg gave so much. 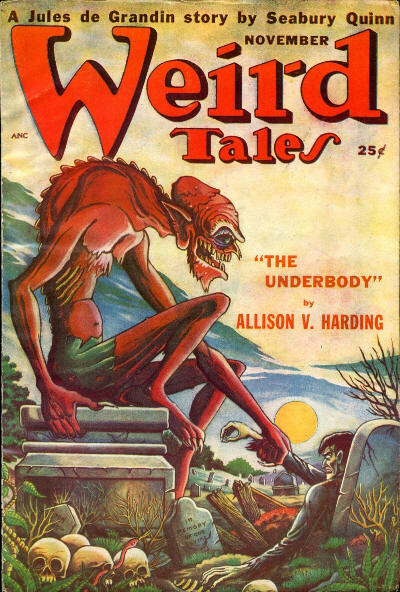 Weird Tales, July 1946, published in the month before Robert Weinberg's birth, a happy event of August 29, 1946. The cover art, perfect for this Halloween season, was by the inimitable Matt Fox. "Child, child--come with me--come with me to your brother's grave tonight. Come with me to the places where the young men lie whose bodies have long since been buried in the earth. Come with me where they walk and move again tonight, and you shall see your brother's face again, and hear his voice, and see again, as they march toward you from their graves, the company of young men who died, as he did, in October, speaking to you their messages of flight, of triumph, and the all-exultant darkness, telling you that all will be again as it once was." Thomas Wolfe had a special claim on October: he was born in this most nostalgic and evocative of months in 1900, and he returned to the subject of October again and again in his writings. Wolfe's brother Ben--his closest brother--died in that same month in 1918 of the Spanish Flu, a disease that killed more people worldwide than the Great War that had waged before it. Nearly one hundred Octobers have passed since then. Now summer is gone and October has come again, as Wolfe chanted in the passage from which the quote above is taken. This is the season of cut corn and apple cider, of woodsmoke and leaves aflame, of pumpkins, apples, squash, and remembrance. The world and life will come 'round again, but for now, plants retreat into seed, root, and rosette, insects into egg, pupa, and diapause, small animals into their burrows and dens, and we into sweaters, home, memory, and hope. Edgar Allan Poe died in October. The anniversary of his death--October 7--just passed. Harry Houdini died in October, too, fittingly on Halloween 1926, ninety years ago this month. 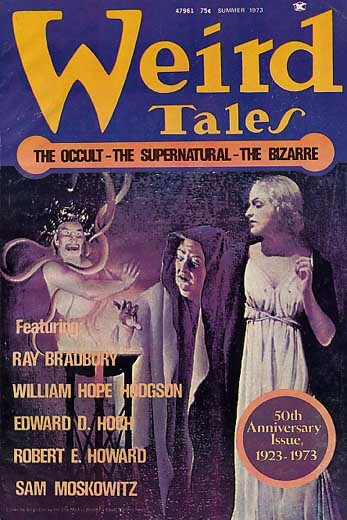 Those two men were the only authors of whom I am aware who appeared in both name and figure on the cover of Weird Tales. 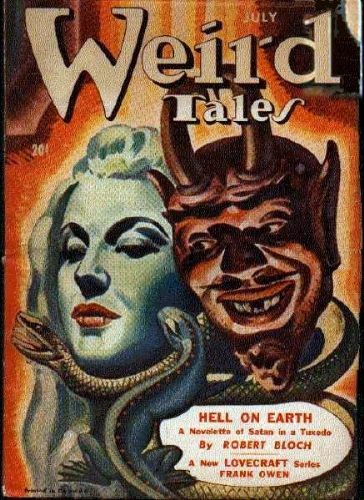 The faces of two artist/authors were on Weird Tales: Virgil Finlay and Hannes Bok created self-portraits in two covers respectively. 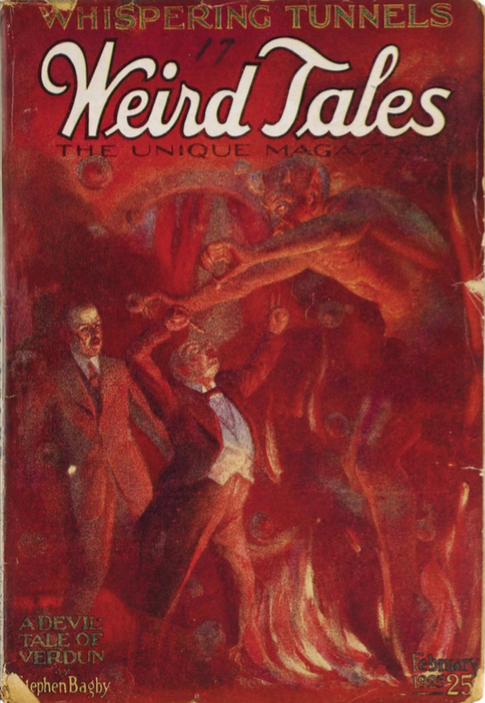 The last cover shown here from the original run of Weird Tales is less certain to fall into the category of authors on the cover of the magazine. I have included it here only as a possibility. 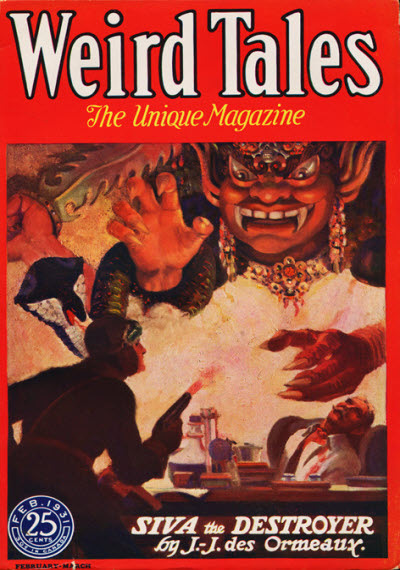 Finally, there is the cover of the Fall 1984 issue of Weird Tales, created by Ro H. Kim with Brinke Stevens as his model. So, two named authors, two self-portraits, a modeled portrait, and an uncertainty. 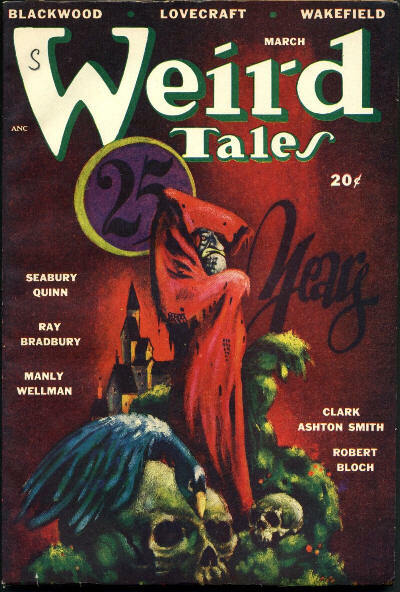 Those make the authors on the cover of Weird Tales from 1923 to 1985. Weird Tales, March 1924. 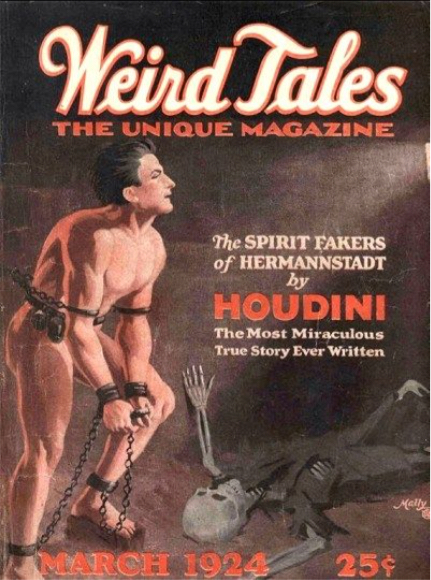 Cover story: "The Spirit Fakers of Hermannstadt" by Harry Houdini. Cover art by R.M. Mally. Weird Tales, February 1937. 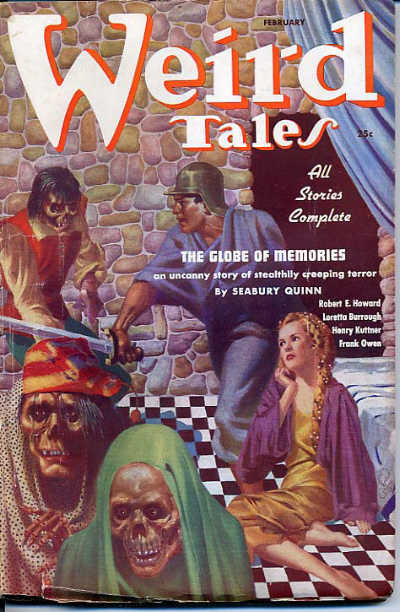 Cover story: "The Globe of Memories" by Seabury Quinn. Cover art by Virgil Finlay. The figure of the swordsman in the center is almost certainly a self-portrait of the artist. Weird Tales, September 1939. 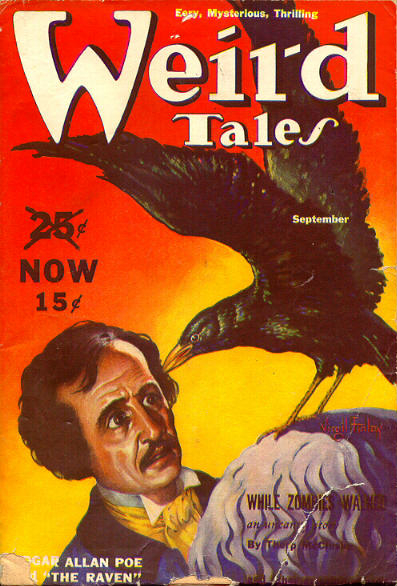 Cover poem: "The Raven" by Edgar Allan Poe. Cover art by Virgil Finlay. Weird Tales, July 1941. 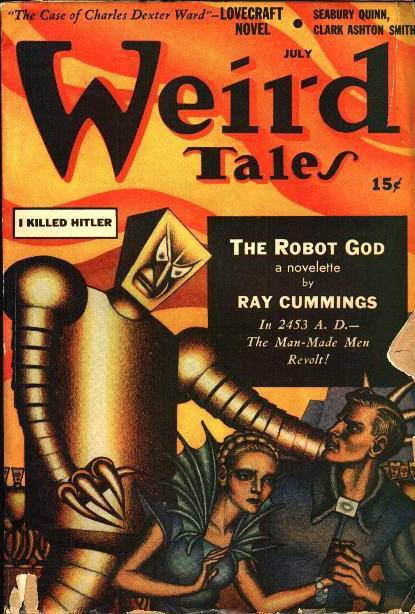 Cover story: "The Robot God" by Ray Cummings. Cover art by Hannes Bok. Again, the male figure is probably a self-portrait of the artist. Weird Tales, September 1950. Cover story: "Legal Rites" by Isaac Asimov and James MacCreagh (sic) (Frederik Pohl). Cover art by Bill Wayne. Asimov co-authored the cover story--that looks an awful lot like him on the right. The anatomy is odd. Note the oversized hand and the misplaced arm. Weird Tales, Fall 1984. Cover story: "The Pandora Principal" by Brinke Stevens and A. E. van Vogt. Cover art by Ro H. Kim with Brinke as his model.